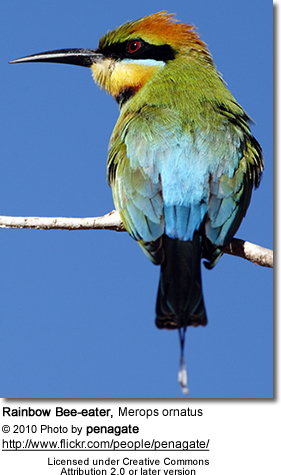 The upper back and wings are green in color, and the lower back and under-tail coverts are bright blue. The undersides of the wings and primary flight feathers are red and tipped with black, and the tail is black to deep violet. 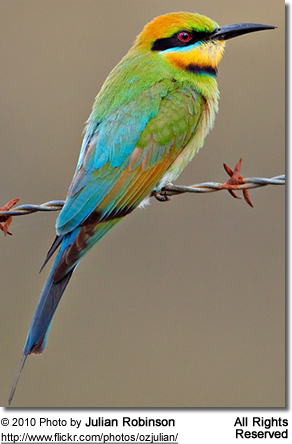 The rainbow bee-eater's two central tail feathers are longer than the other tail feathers, and are longer in the female rainbow bee-eaters than in the males. 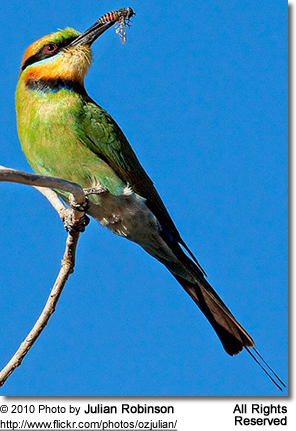 The crown of the head, the stomach and breast, and the throat are pale yellowish in color, and the rainbow bee-eater has a black bib and a black stripe through its red eye. Breeding season is before and after the rainy season in the north, and from November to January in the south. 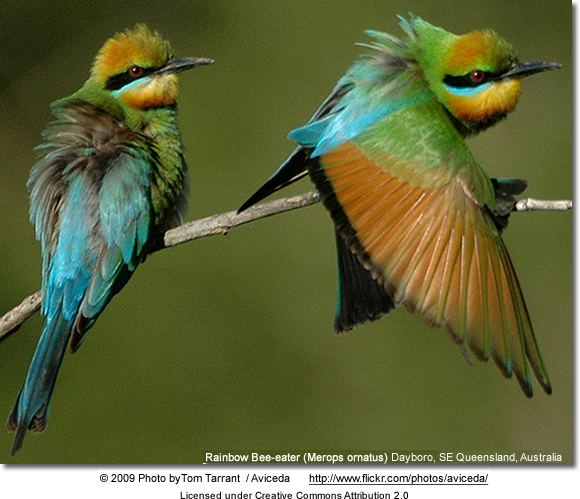 Rainbow bee-eaters are believed to mate for life. The male will bring the female insects while she digs the burrow that will be their nest. 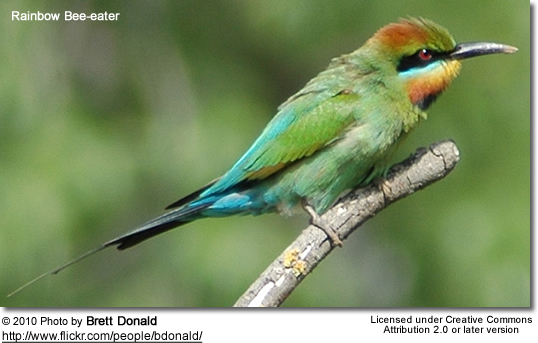 The bee-eater digs its burrow by balancing on its wings and feet, and digs with its bill, then pushing loose soil backwards with its feet while balancing on its bill. 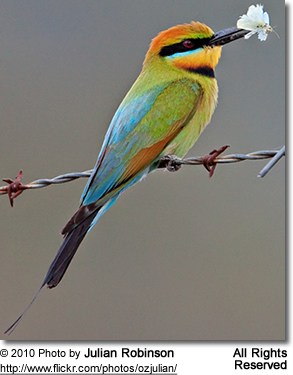 The female bee-eater can dig about three inches down every day. The nest tunnel is very narrow, and the birds' bodies press so tightly against the tunnel walls that when the birds enter and exit their movement acts like a piston, pumping in fresh air and pushing out stale air. 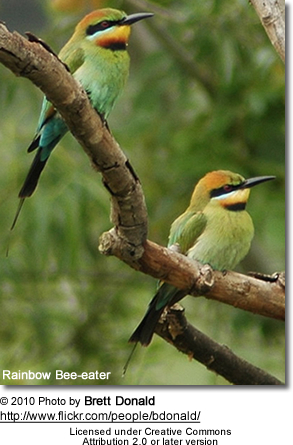 Rainbow bee-eaters have also been known to share their nest tunnels with other bee-eaters and sometimes even other species of birds. The female lays between 3 and 7 glossy white eggs, which are incubated for about 24 days until hatching. 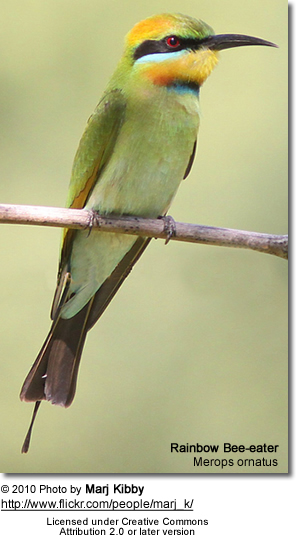 The young bee-eaters fledge after about 30 days and are fed by both parents, as well as any older bee-eaters that may not have paired off or have lost their mate. Cane Toads are known to prey on nestlings. 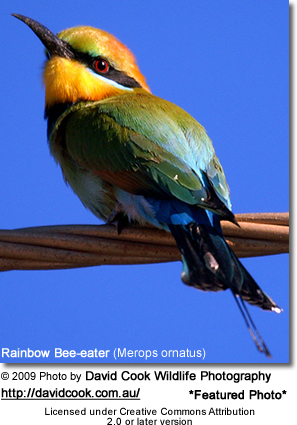 Rainbow bee-eaters are always watching for flying insects, and can spot a potential meal up to 150 feet away. Once it spots an insect a bee-eater will swoop down from its perch and catch it in its long, slender, black bill and fly back to its perch. 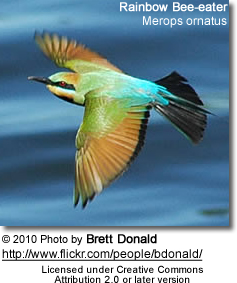 Bee-eaters will then knock their prey against their perch to subdue it. 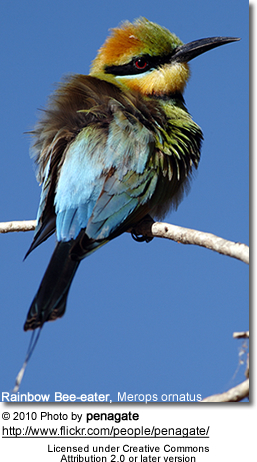 Even though rainbow bee-eaters are actually immune to the stings of bees and wasps, upon capturing a bee they will rub the insect's stinger against their perch to remove it, closing their eyes to avoid being squirted with poison from the ruptured poison sac. Bee-eaters can eat several hundred bees a day, so they are obviously resented by beekeepers, but their damage is generally balanced by their role in keeping pest insects such as locusts, hornets, and wasps under control. Boland, C. R. J. (2004). "Introduced cane toads Bufo marinus are active nest predators and competitors of rainbow bee-eaters Merops ornatus: observational and experimental evidence". Biological Conservation 120 (1): 53–62.